Pre-drawn elevation diagram symbols represent frame, divider, drawer, baskets, suitcase, etc. These symbols help create accurate diagrams and documentation. 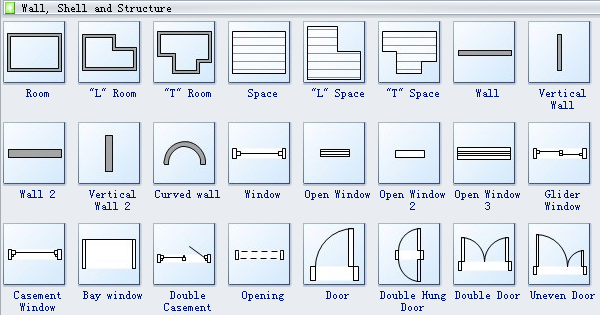 Edraw floor plan software provides you lots of elevations shapes, frame, divider, drawer, baskets, suitcase, lattice, clothes, quilts, hooks, cabinet light, droplight, ceiling light, desk lamp, door, double-door, arched doorway, rect doorway, etc. 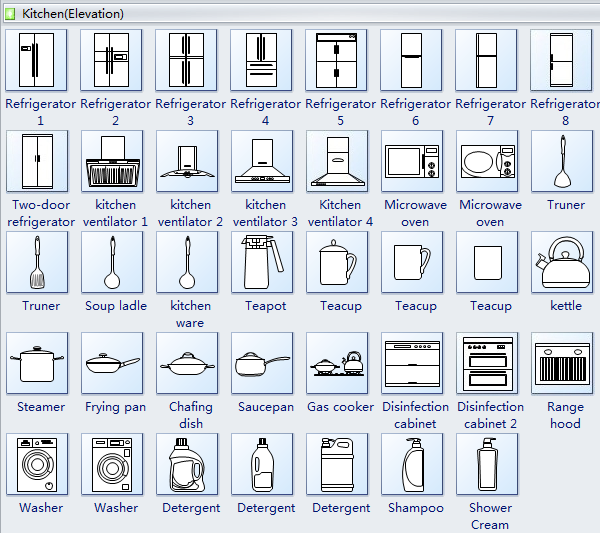 All these shapes will surely make your diagrams look professional and attractive. Frame is a rigid structure that surrounds something such as a picture, door, or windowpane. 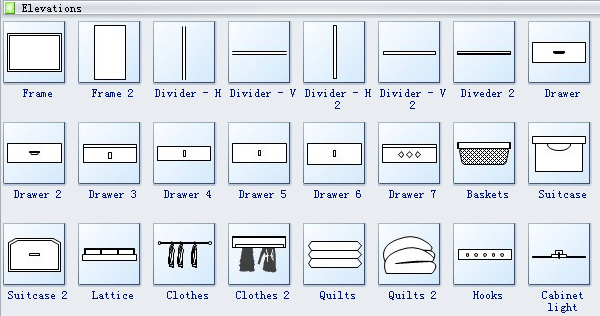 Divider is something that divides a whole into parts. Drawer is a box-like storage compartment without a lid, made to slide horizontally in and out of a desk, chest, or other piece of furniture. Lattice is a structure consisting of strips of wood or metal crossed and fastened together with square or diamond-shaped spaces left between, used as a screen or fence or as a support for climbing plants. Hooks are pieces of metal or other hard materials curved or bent back at an angle, for catching hold of or hanging things on. Drop light is an electric or gas lamp suspended from the ceiling or wall by a flexible cord or tube. Ceiling light, as its name implies, is installed on the ceiling. Desk lamp is usually put on the desk and it can help you work more efficiently, productively and comfortably. 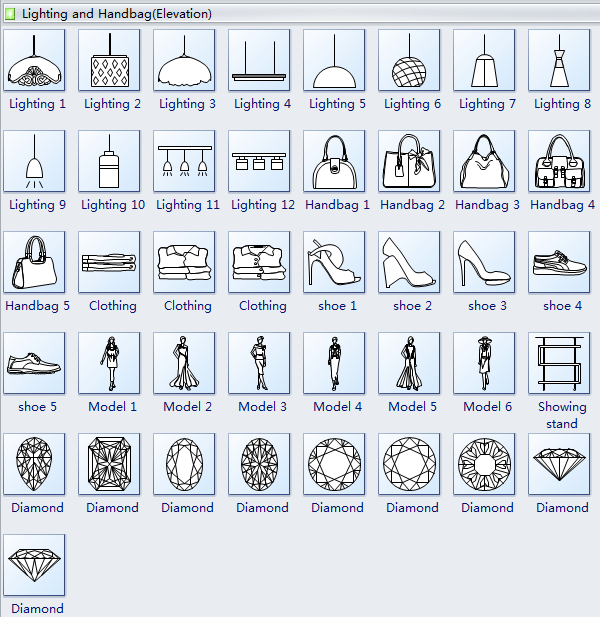 All kinds of lamps, handbags, shoes, clothes, models and diamond, etc., are available here. Flue is a channel for conveying heat. Drainage pipe is a pipe that removes water from a particular area. All kinds of kitchen appliances are available here like teapot, teacup, kettle, steamer, frying pan, etc. 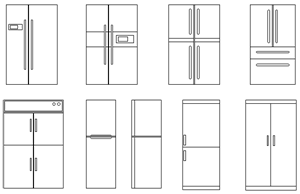 Refrigerator is a large container which is kept cool inside, usually by electricity, so that the food and drink in it stays fresh. Range hood is a device containing a mechanical fan that hangs above the stove or cooktop in the kitchen. Gas cooker is a range with gas rings and an oven for cooking with gas. 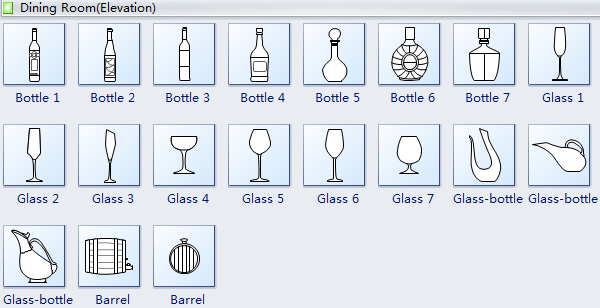 Different kinds of bottles and glasses are available here in the dining room elevations. 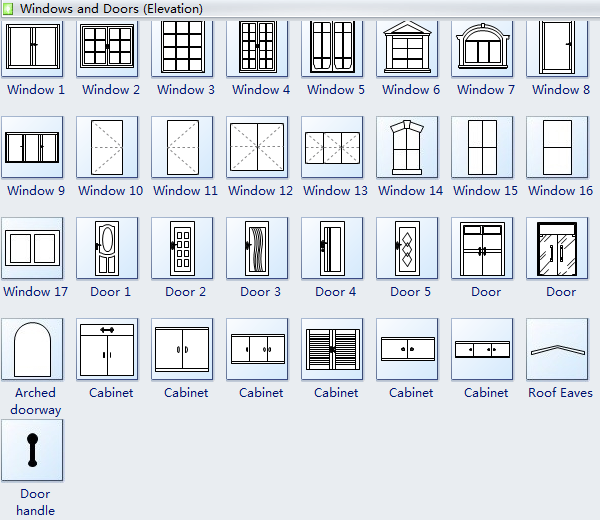 All kinds of windows, doors, cabinets and doors symbols are available here. Bay window is a window space projecting outward from the main walls of a building and forming a bay in a room. Need fresh looking elevation diagram symbols for your design? These elevation diagram symbols are a cinch to pop in. And their crisp, fine detail will make spectacular, easy-to-understand diagrams and presentations to your customers.